September means Citibank Restaurant Week India! A whole week of ‘food glorious food’ and tough decisions (so many places to try, so little time). 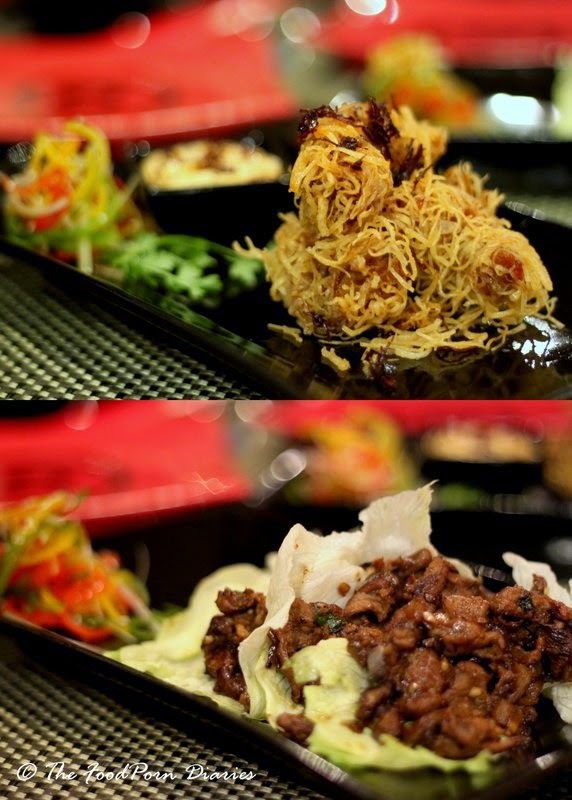 I was invited for a preview dinner at one of the participating restaurants and chose Republic of Noodles. In all honesty, it was not my first choice but the world works in mysterious ways and I’m actually glad I went there last night. After Indian food, I think Asian food is something that tickles my palate – the complexity of flavors never ceases to amaze me. Republic of Noodles is located at the Lemon Tree Premier on St.Johns Road. 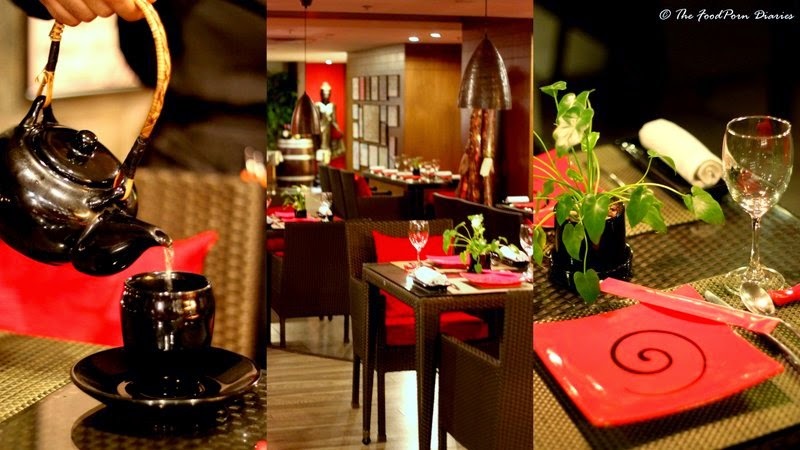 Started in Goa in 2007, this award winning restaurant has slowly made its mark as an excellent destination for food from the regions of China, Thailand, Vietnam, Malaysia, Indonesia, Singapore, Cambodia, Laos and Burma. After alighting from the lift, you walk through a wooden door to step into a space dominated by red and black. The Buddha statues and green plants add the much needed contrast to the heavy colors and in the end it results in creating an intimate and warm dining space. The restaurant week menu is curated to showcase a tapestry of the restaurants top dishes and that makes it harder to narrow down your choices. Lucky for you, I’m ruthlessly decisive when it comes to what I want to eat. (I had already made a mental note of my order by looking at the menu on the RWI page). I also very casually offered Arv suggestions on what he must order. That way I had all my bases covered! (OCD much? Yes!). The wait staff offered us the drinks menu (not part of the RWI steal-deal) and the RWI menu and waited for us to make our choices. 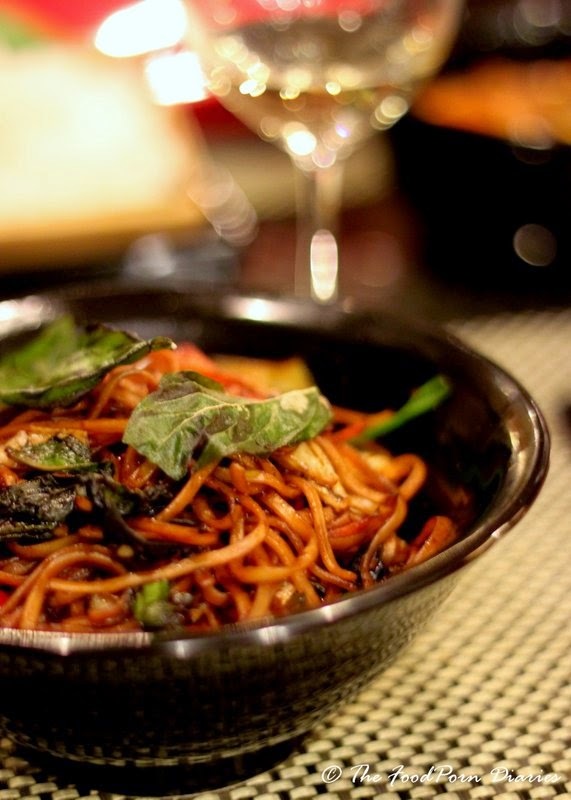 Apart from an appetizer, main course and dessert – Republic of Noodles (RON) also offers a Green Mango Salad or a Tom Yum Veg Soup to start with. Arv with his crazy running and football practice looked like he was coming down with a cold and he immediately picked the Tom Yum to offer him some much needed nasal solace. I on the other hand, cannot resist the allure of a Green Mango Salad. 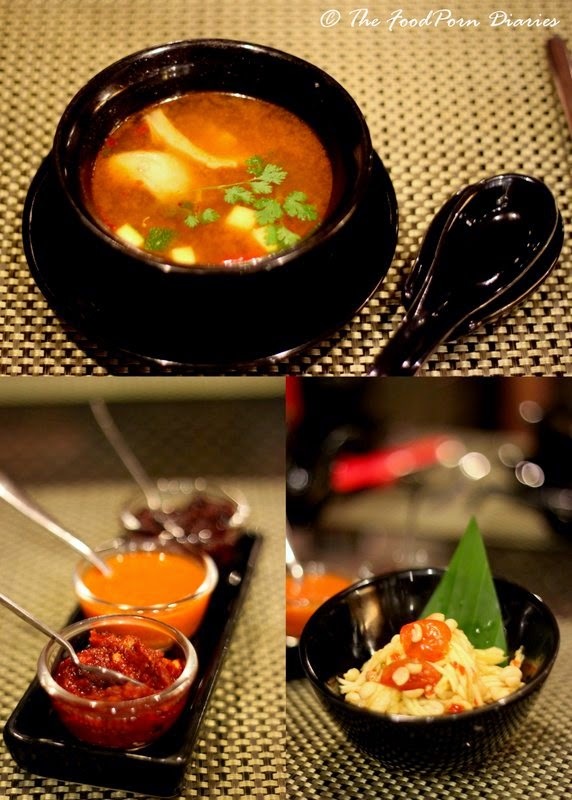 The Tom Yum Soup was rich with the heady aromas of kaffir lime, galangal and basil and a great way to start a meal. But the Green Mango Salad was something else altogether. Strips of Green Mango and roasted cherry tomatoes dressed with a sweet-spicy-tangy sauce and generously dotted with roasted peanuts. I literally slurped the remaining dressing from the bottom of the little bowl! For Appetizers, Arv went with the Crispy Thread Prawns with XO Mayo and Golden Garlic. Four large succulent prawns wrapped in thread noodles and deep fried to a crisp. The XO mayo was interesting, but he much preferred to eat it with the spicy pounded chilli paste on the table. This one makes a great bar snack and would have been perfect with some beer. My only grouse was that the Thread noodles had soaked in way too much oil for my liking. I had ordered the Char Grilled Lamb with Spicy Basil and Cold Iceberg Lettuce. This one was perfect. The succulent lamb strips were made even more delicious by the basil and chilli sauce that coated it ever so lightly. And the lettuce cups made you believe you were actually eating a salad! Because we were here for the preview, I was offered a small sampling of two other appetizers. (Of course I get perks: P). The vegetarians will love the Chilly Plum Glazed Crispy Shitake Mushrooms and Black Fungus. I think chilly plum glaze on anything is genius – so clearly I’m already bought over! The most sublime part of the whole meal actually came wrapped in a plain banana leaf package. The Singapore Style Banana Leaf wrap grilled fish just blew my mind. I didn’t even mind that the fish they used was Basa – that’s how beautiful this was! You open the package to reveal a kaffir lime leaf and a slice of onion resting on perfectly steamed fish. You pop a piece into your mouth and it just melts – leaving behind pops of kaffir lime and chilly on your tongue. Just exquisite. For Main course I had my heart set on the Roast Duck Red Curry with Grapes. I choose to have this with some fragrant Jasmine Rice. Arv was torn between the Malaysian Family style Chicken with Green Beans and the Pork Laotian Bong Sauce with Bamboo Shoot and Cilantro. In my world, Pork always trumps Chicken and I expertly guided him towards the same. I love it when my good deed for the day is related to food! 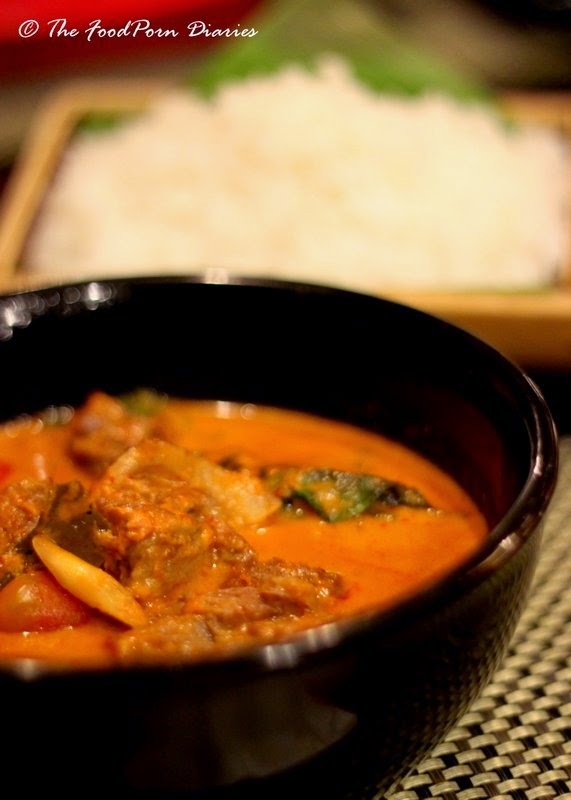 The Roast Duck came in a wonderful silky curry redolent of Thai flavors. The disappointment however was the treatment meted out to the duck. No one ever won a prize for roasting a duck, ensuring it gets a crackling crisp skin and then dunking the thing into curry so that the skin gets all flabby and frankly unsightly. I rescued my main course by diligently prying the skin away from the beautiful pink tinged meat, but I doubt everyone else will have the patience or the sheer gumption to go through with the dissection. Arv won the lottery on his main course. The Pork Laotian Bong Sauce (really don’t know what it means) with Bamboo shoots was very agreeable. Reminded me of a cross between a Naga Pork curry and some Malaysia rendang. We thought this would taste best with the Jasmine Rice but the surprise was how well it paired with the Chilly Basil Udon Noodles. Now I’m very partial to Udon noodles – the thick wheat flour noodles ticks all the boxes in my quest for a perfectly chewy and robust noodle. So I sneakily started piling my plate with more and more of this until I thought I would burst from eating so much! 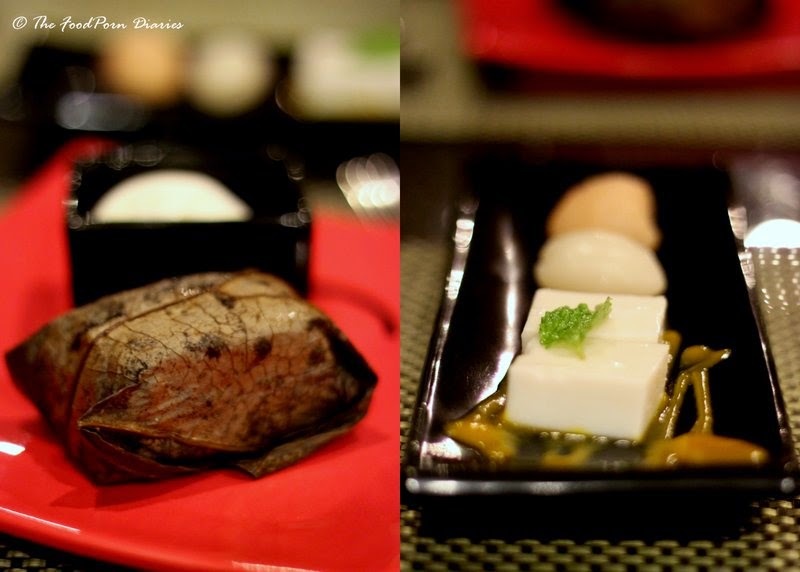 (The portions for both appetizer and main course are such that it can easily feed two people!). Asian desserts are seriously uninspiring. I doubt a bowl of tropical fruit with jelly will ever trump a gooey fudge cake with chocolate ganache, but yet they try. I ordered the Almond Bean Curd with Lychee and Rambutan. I didn’t know they were being so literal with “Lychee and Rambutan” – there was 1 lychee and 1 rambutan! 🙂 The almond bean curd itself was panacotta like, albeit not as silky. The zing was provided by a dash of mango puree that actually complimented the bean curd very well. Exotic – yes, oh-my-god-this-is-so-awesome …No. Arv pounced on the one thing that remotely resembled a western dessert – Banana Chocolate Cake. This one however was wrapped in a Lotus leaf and steamed. Pretty nifty actually, and it also tasted very good, especially with the vanilla ice cream. The service at RON requires special mention with the wait staff being both knowledgeable and polite. The cutlery was changed for each course and they were smart enough to arrive when we needed something and discreet enough to leave us alone when we were absorbed in conversation. On the whole the experience is well worth the Rs.900/-++ that the RWI menu charges. 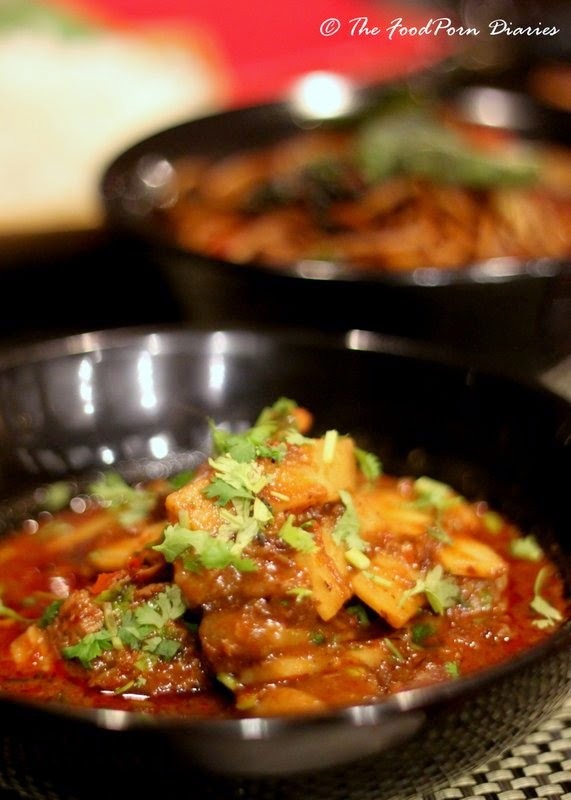 You can even order one of their signature main courses for an additional Rs.200/-. Restaurant Week India runs till the 28thof September for both lunch and dinner in 30 of the finest restaurants in Bangalore. You will however need to log into their website and reserve a table first. Bon Appetit my lovelies!